Super Bomberman (AKA スーパーボンバーマン Sūpā Bonbāman in Japan) is the first video game in the Bomberman series released for the Super Nintendo Entertainment System (SNES), released in 1993. It was followed by Super Bomberman 2, 3, SB4 and Super Bomberman 5. It is a delicious non-scrolling maze game! The SNES is the platform for some of gaming’s forgotten classics. The roster is long, but one of the games that retro gamers should really try is Super Bomberman. Super Bomberman epitomizes what most great SNES games were about, having fun in the simplicity of design. Really, this game made players play the role of 2D sprites, which moved on an X and Y axis. They pushed a single button to plant a timed bomb to blow their enemies to smithereens. The game is very simple to pick up, but was nevertheless incredibly addictive. The first few levels are relatively simple and easy. As the levels progress, new power ups and game mechanics are introduced to add to the complexity and depth of the game. However, the core mechanic of planting the bomb at the right place at the right time remains the same. The mounts, power ups, and other game play features all come together to give Super Bomberman a very solid and fun single player experience. The game’s difficulty could be frustrating at times, but that should come as no surprise seeing how this was a game made for the SNES. Aside from its robust single player experience, Super Bomberman affords players the chance to play with friends. They can either play a two player cooperative campaign or play on versus mode. Co-op becomes more challenging as the game places more enemies and obstacles than a single player run through. The difficulty spike is welcome though since it will force players to cooperate and plan their way into victory instead of brute forcing their way through. 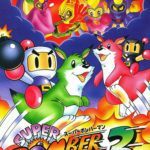 All in all, Super Bomberman for the Super Nintendo SNES is a blast from the past that gamers looking for something retro to play should not pass up on, especially when it is played with a friend.